The SnapJacket is the toughest and longest lasting option to preserve or repair aging marine piling. The SnapJacket’s design makes it very easy to install, keeping dock repair costs to a minimum. 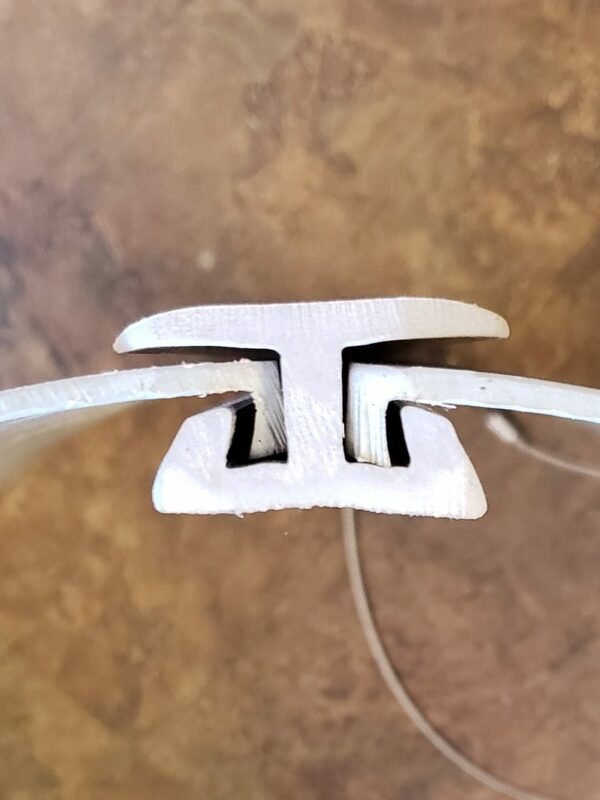 By opening up and easily locking back together, using the SnapJacket does not require you to disassemble any portion of the structure built on top of the piles. Gone are the days of needing large barges to come in and take apart portions of the dock to replace a single pole. 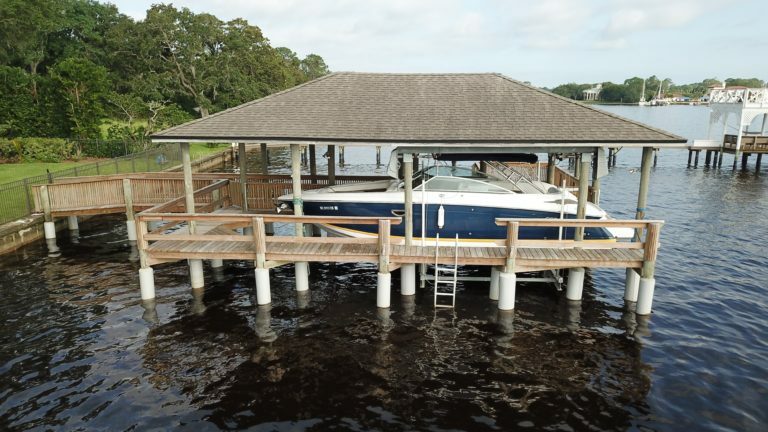 Pole replacement can be very costly, especially if there is a structure built on top of it, such as a boathouse or boatlift. Once the jacket is filled with cement, all marine boring organisms that are eating away the inside are instantly killed. The concrete flows into the voids creating a new solid piling. Using the SnapJacket will help you preserve your piling that are beginning to show signs of aging, and with proper engineering the SnapJacket can even restore a completely broken piling to beyond its original strength. The concept of jacketing pylons is nothing new, we have just made it affordable to a homeowner for the first time. 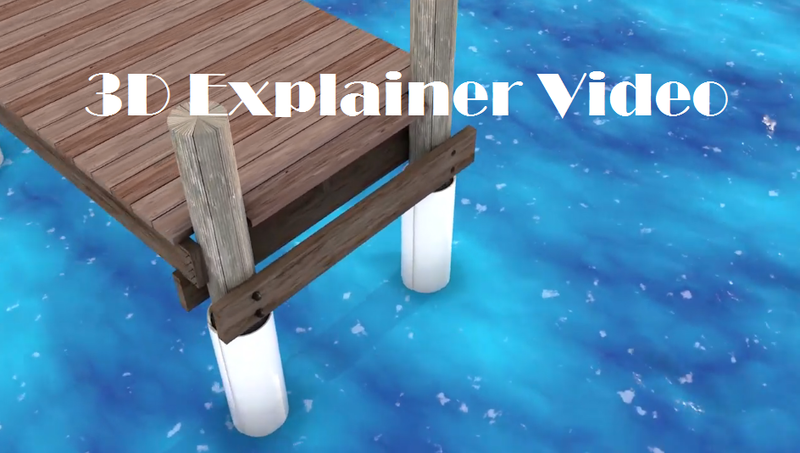 Check out the video’s below for more information on how they work! This video demonstrates that the Jackets do a lot more than help structurally, they upgrade your dock cosmetically as well. 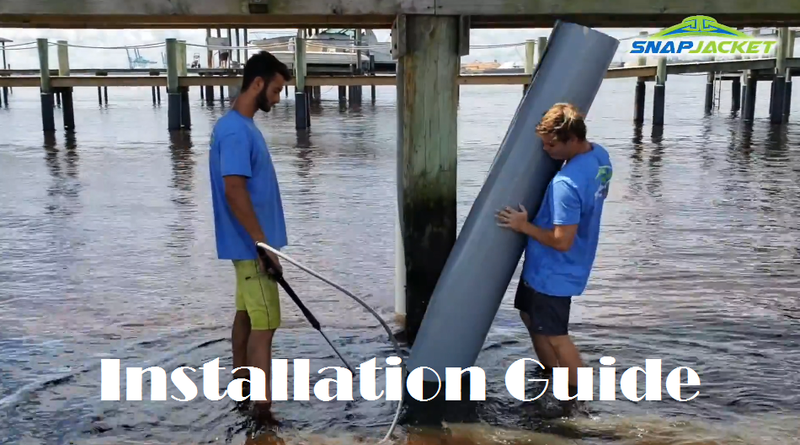 This video is a step by step guide that walks you through every portion of the installation process. This video explains the benefits of utilizing the SnapJackets for piling repair, and offers a 3D look into how they are installed. 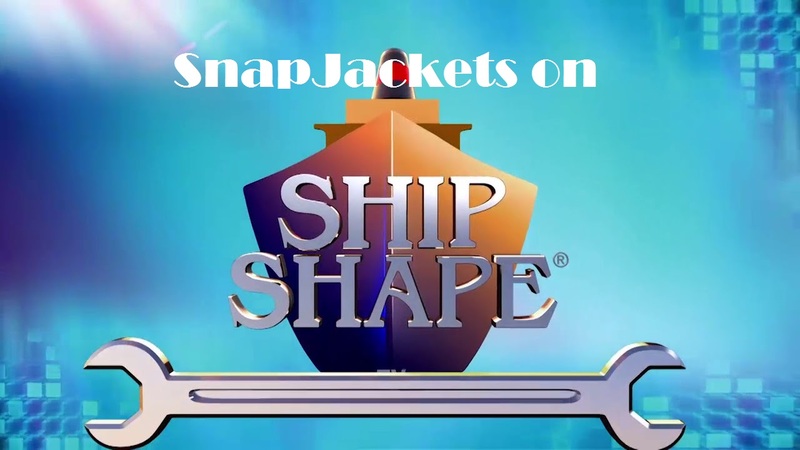 Ship Shape TV's John Greviski trusts SnapJackets to keep his boat lift pilings strong. *note that the jackets shown use an old design for the locking mechanism. SnapJacket is the solution for aging marine piling. The installation video above demonstrates just how easy the SnapJacket is to install for timber piling repair. Available in 10, 12, 14, and 16-inch diameters, the SnapJacket will fit around most marine piles. We recommend you choose a piling repair jacket that has at least an inch and a half of annular space all the way around the pile. Simply cut the jacket to length, blow out the sand and slip it around the pile without disturbing any of the deck above. Next slide the locking device down the middle and your form is ready to fill. Pour the void with concrete and never worry about your piling aging again! Due to the fact that PVC does not wear down in the water, we offer a 25-year warranty on the SnapJacket. The concrete will remain untouched by the elements, effectively fossilizing everything inside of the jacket. Theoretically, this piling repair jacket should last a lifetime and then some. What causes a piling to rot? You probably have seen the telltale “hourglass” shaped piling and you may own one yourself. Pilings decay fastest between the low tide and high tide mark. Few people realize that just like termites, there are wood boring clams and shipworms that exist in any body of water. 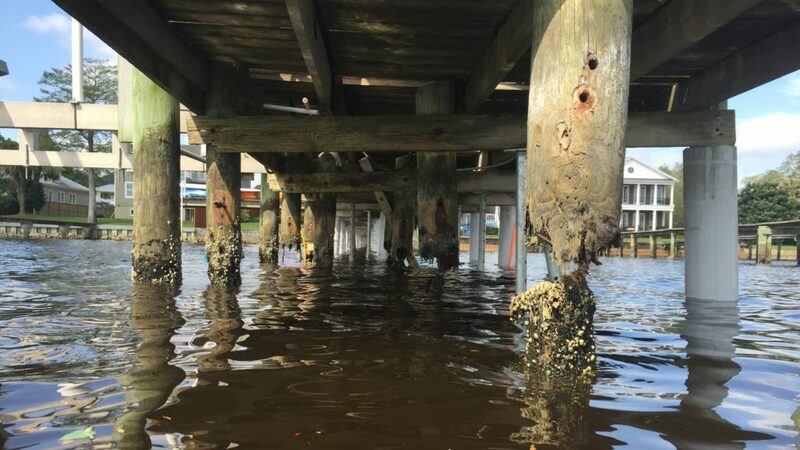 Your pilings are a plentiful source of food and safety. 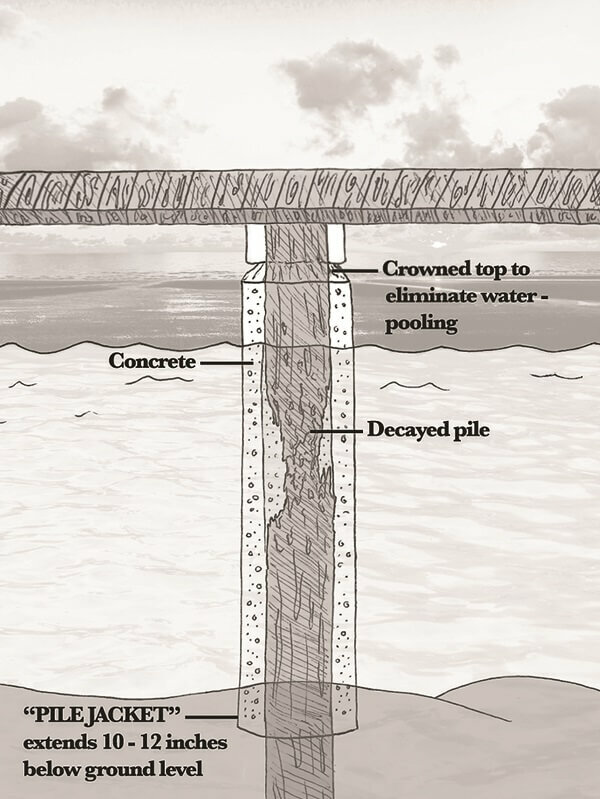 Once they take refuge in your piling, you are on the road to the inevitable replace or repair decision. The SnapJacket piling replacement system permanently entombs these creatures and turns your weakened wood piling into a stronger cement one protected by a PVC jacket. When you choose us for timber piling repair, you are left with an impenetrable barrier to marine organisms and that’s why it lasts 50+ years. How long will a snapjacket last? Snapjacket is constructed using UV protected PVC material. It’s extremely durable and we guarantee it will last at least 25 years. In reality, it likely will last much longer than that. 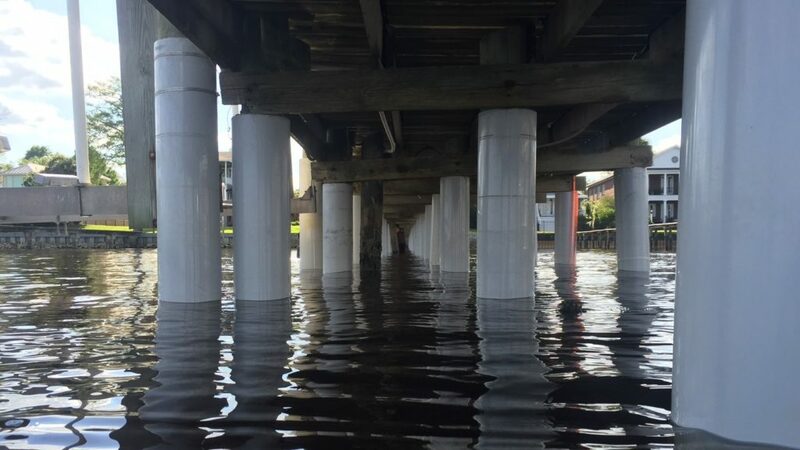 The Timber Council published a study that says marine pilings using this technology will last “indefinitely”. You can view that study here. Once you watch our installation video and have all the materials on hand, it should take an experience crew of 2 people about 5 minutes per piling to place the jacket. Concrete can be placed in as little as 2 minutes per pole, depending on the filling method. A homeowner would likely take about 20 mintues to mix bags of cement and pour them into the void. You can leave your cranes and barges at their home dock because you likely wont need them. To install the SnapJacket you will need a powerwasher or jet pump to blow out the sand out at the bottom. The jacket is cut with a sawzall with a fine tooth blade. All that’s left is getting the concrete into the SnapJacket. Watch our installation video for more helpful hints. What size SnapJacket do I need? We recommend that you have at least 1.5 inches of annular space around the jacket. When pumping cement into the jacket, using a flexible flat hose over the end of the cement hose will allow you to fit the hose into tighter voids, so it is easier to use a tighter jacket. When pouring mixed cement in from the top, it is easier to have more space to allow the concrete to fall in easier. You will need more concrete but will save yourself the headache of getting the cement to fall through such a small void. Can you use a SnapJacket with a floating dock hoop? You can, but we recommend upgrading to a larger diameter ring to accommodate the jackets larger diameter. 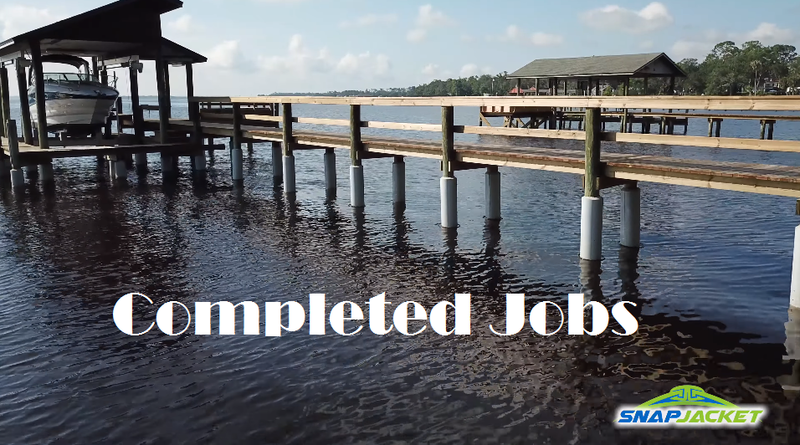 Retrofitting a floating dock with Snapjackets can be tricky as adding the extra thickness around the piling can effect the way a floating dock moves with the tide. Having a very tight space with little wiggle room can scratch up the jacket as the dock repeatedly floats up and down. To best protect the jacket, we recommend upgrading to a hoop with rollers or a plastic liner on the inside. See the Pile Glide by Carolina Water Works or something similar. Can I clean the SnapJacket? You sure can! Just use an abrasive brush to remove marine growth. However, cleaning the SnapJacket is not required and has no effect on its useful life. The plastic is far easier to keep clean than wood. Pro tip: by using flexible irrigation line to make a circle around the jacket, the ring will float up and down around the pole. By going up and down with the tide everyday it will agitate the barnacles off before they have a chance to latch on and die, leaving you a much cleaner and more aesthetically pleasing pile. How is the SnapJacket good for the enviroment? Because the wood piling is encapsulated with concrete and the SnapJacket, it creates a water tight seal. 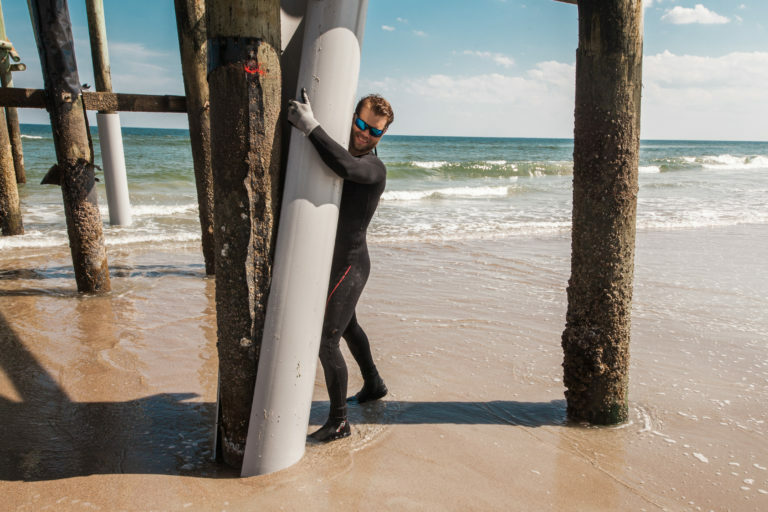 All pilings are pressure treated and contain harmful chemicals that are toxic to marine creatures. This seeping happens immediately after the piling is installed. Using SnapJacket stops this process.